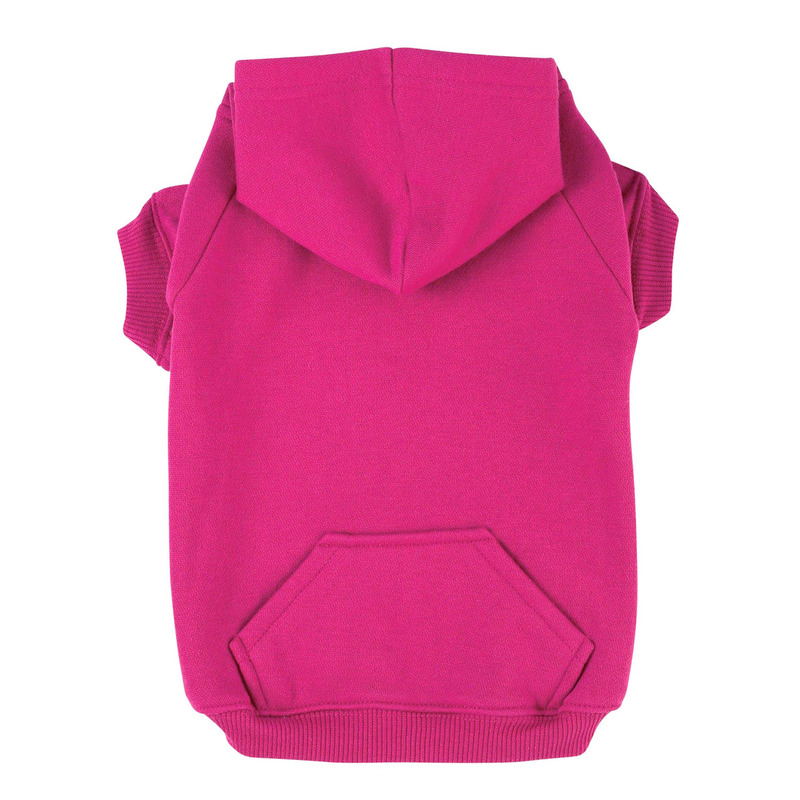 With our Zack & Zoey™ Basic Dog Hoodie in Raspberry Sorbet, your pet can enjoy the same comfort you do in a hoodie made just for them! For those cool weather days when your dog needs a little extra insulation, the Raspberry Sorbet Basic Dog Hoodie is a yummy pick! 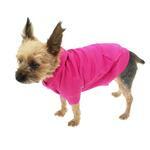 This cheery pink hue will have your pup standing out and feeling toasty even on the dreariest of days. 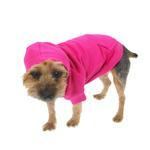 Basic Dog Hoodie - Raspberry Sorbet Customer Photos - Send us your photo! her name is Ruby Jones and she feels so comfy in this hoodie! Mellie looks adorable in the raspberry sorbet hoodie. So soft and she has received compliments. Great colors to choose from, Sizes to fit anyone, even a Frenchie, easy on and easy off. I feel pretty in my new raspberry outfit. Covers my head, neck, chest & belly with room to take care of business. Thank you BaxterBoo! Lucy loves her Raspberry hoodie. She wears an X-large and is a 50 lb Pointer. We always get compliments and smiles when walking when she wears any of her Baxterboo stuff. She is loves to give kisses and has no idea she is a dog. She suffers with anxiety.... eg: thunder frightens her. So we have been advised to buy her pajamas and clothes. We found your site and just recieved your hoodie. Will definitely be shopping for more clothes for her:) thanks baxterboo! Lulu loves her Baxter Hoodies!!! I’m fact, she just can’t live without them! Winter is so cold (especially when you’re a 4 pound Yorkie!) The X-small is perfect, snuggly fit! It goes on easily and washes like a dream! Plus Lulu can still run like the wind while wearing them! Good thing Mommy ordered more! ?? Gracie got her new hoodie today & we both love it! Dachshunds can be a challenge to fit, but this really works well! There is more than enough length to cover her long & low figure! The "sleeves" are a tad long for her short little legs, but a quick tuck with a needle & thread will take care of that! Wearing my hoodie so I don't melt in the rain! Might as well be a Mountain Goat! My little rescue babies love their Zack & Zoey hoodies. They are perfect for lounging or walking around the block. Tootsie loves to lounge in her hoodie. She barks at me when she's ready to put it on. Phronzee(3yrs), Sophee(4yrs), Dayzee(6yrs) and Noree(2yrs) are enjoying a beautiful December day outside, in their new XL Hoodies! The bright colors make it easy to find them when they run crazy through the yard! Our girls are sisters one liter apart .. They are full of love and energy .. Two bundles of cuteness! Hazel would get really cold at night amd early in the mornings ands he would want to be all cuddled up next to me covered in blankets. When I would leave for work or school she wouldn't want to leave my bed because of how cold it was! Her ears were always cold so I got her this hoodie and she loves it! It keeps her warm and it also looks adorable on her! My boyfriends dog was also having the same problem so I ordered her one too! Bailey in her pink hoodie! Zoie is a 7 month old great dane and weighs about 85 lbs. She has on the Zack and Zoey XXL raspberry hoodie and then I added a glitter vinyl paw print on the front between her front paws and then on the pocket I did her name and another paw print. She loves the hoodies. Penny gets chilly easily and loves her sweatshirt! She is wearing the xs. The size guide was very helpful in helping me order. Sushee Staten is our spunky little pug. She always has on her Baxter Boo Hoodie to prevent her from scratching her belly to hard and they have been life savers!!!! PeeWee loves to wear his hoodies. he has 5 colors. people are always stopping us to compliment him on his coolness. His hoodie saved his life. PeeWee was attacked by a wolf/dog & received only a scratch. The wolf/dog got a mouth full of hoodie! Zoe enjoys lounging in her her Zack and Zoey hoodies (she also has red). They help keep her warm and are so cute. Loving my super comfy hoody!! Rosa loves being warm and cozy and girlie in her Baxter Boo hoodie. Candy decorated her sweatshirt to tell everyone she was going to be a big sister! Iyla (eye-la) was a rescue at 4 months old and is now 10 months old. She is Miss Piggy because she likes to eat everything she can get her little mouth on... the ball didn't last long. I love Pitties and she has been my joy since day one. She loves to cuddle and be silly. She hates being cold which is why I bought her a hoodie and she loves it! Staying nice and cozy in her Baxterboo sweatshirt! Sure came in handy with the winter we have had!! Toya and her brother Tony sporting their new matching Baxterboo hoodies. They're perfect for chilly night walks and when the house gets a little too cold for these puppies. Lacy dog sporting her new (and well fitting!) Raspberry sorbet hoodie!!! I recently adopted Miley from a doberman rescue group so this is her first hoodie!!! It's been really cold here in Dallas and she kept shivering everytime we would go for a walk. I decided on the Raspberry Sorbet hoodie so that everyone would know that she's a girl and not a boy LOL! Miley loves her hoodie and she no longer shivers outside. I can't wait to add more clothes and accessories to her wardrobe! My new hoodie!! Thanks mom!! Roxy hates the cold. So I got her a large basic hoodie. It was a battle to get it on her, but once I did she loves it! She can now play in the snow without being cold. Gigi wearing her comfy hoodie laying next to her basket of toys. Phoebe (black- age 6), Maggie (white/"red" which is really more tan- age 6), and Suzy (gold- age 7) love their hoodies from BaxterBoo! They're so comfortable and cute. We just ordered them two more colors to keep them cozy during the winter! Thanks BaxterBoo! Chloe!! is pretty in pink while supporting Breast cancer awareness. Martha Loves her new Hoodie, and she got it just in time for these chilly nights. It's so warm and cozy. Maddie is a Bugg (half Boston, half pug) designer hybrid, she is about 15 lbs and a very sweet and silly little girl. She will be a year old in October and is a great addition to our family. Maddie loves her hoodie and it keeps her warm. My three girls (Cookie, Olive & Sadie)wearing their sweatshirts while "sledding"
Bella loves her new hoodie! She is a 5 year old Boston/lab mix. That loves pink! Olive is a 50lb pit bull mix who is comfy in size XL. I think it gives her the little extra flair she needs. I love my new hoodie because it keeps me warm and it is comfy. She is my little nugget!! I love her to pieces!! She is my little nugget!! Love her to pieces!! Lani & Maile are Boxer, Pitbull & Shepherd Mix "sisters" (Lani-1st litter, Maile-2nd litter w/same Mom & Dad). They are 5 1/2yrs & 4 1/2 yrs old. When we tell them "girls, sweaters!" they happily let us put them on. We live in a 28ft. RV so along w/blankies, the sweaters keep them warm!! The girls are extremely close, yet almost totally opposite personalities! Lani thinks EVERY PERSON is her new BFF! while Maile is shy. Lani only wants to chase balls or toys for a few throws then it is off to sniffin' everything! Maile won't stop chasing the ball as long as you don't stop throwing it!! Maile is the hunter (stalks pigeons, bugs, bunnies) but never gets them - I think it's the thrill of it for her. I LUV my girls so much I got a tattoo of their names on my arm!! They are my babygirls!! 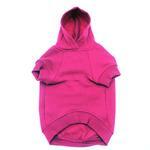 We love the Basic Dog Hoodie - Raspberry Sorbet - XLarge!! Daddy took their sweaters to work & put their names on them!! These aren't their first sweaters but I think these are the best the way they fit the girls & very special with their names on the pockets!! Glad I stumbled onto your site!! Thank you for the quick & reliable customer service!! I mentioned BaxterBoo.com on my Facebook!! she LOVES her new hoodie! Cookie is a 4 month old Shih Tzu/Bichon Mix and is such a little sweetheart. She looks so cute in her new hoodie. In her new shirt looking all sweet and sassy!!! Sunny loves her new hoodie! She's a 47lb Staffordshire Terrier. I bought a large and it fits her perfect! The shirt is thinner than a human hoodie, but is great to add warmth around the house. I will be buying one in a bunch of other colors, too! Kanga's Raspberry Sorbet helps keep her warm during our cold West Texas nights! Reagan needs her hoodie to attend high school classes with me as I teach. Gracie is recovering from surgery and this hoodie not only looks fun and stylish but it keeps her from chewing on her bandages. We think she looks beautiful! This is my chihuahua Sophie sporting her new pink hoodie! She loves it especially since her ears can get really cold. She loves wearing clothes but this one is her favorite! thanks BaxterBoo! Brinkley sometimes gets cold in the winter Florida nights, so her hot Pink hoodie is ideal. Thanks BaxterBoo. Molly loves getting her picture taken in her hoodie. Eleanor stays warm and beautiful in her raspberry hoodie. Warm and comfy in her new hoodie! Madison is warm and stylish her very first time in the snow! Lundi received a Raspberry Hoodie for her 5th Birthday. She loves it! Thanks Baxter Boo! WE ARE GONNA BE WARM THIS WINTER WITH OUR NEW HOODIES!!! Keeping warm during the night! Missy being a diva in her new raspberry hoodie! Don't look directly into the cuteness. I love my pink hoodie! Thanks, Mom! My hoodie keeps my ears warm! Lily loves her new sweater! It's fuzzy and warm and it actually fits her long dachshund body! :) plus the color looks great on her, too!! It's so soft & cozy! Pretty Frost loves her brand new Raspberry Sorbet hoodie! Lucy Lulu loves her new Zac and Zoe Hoodie that shields her from the wind off the Hudson River. And in Raspberry she will no longer be mistaken for a boy dog! Thanks Baxter Boo! This Hoodie is perfect for my Chihuahua. MY Great Dane/Plott Hound mix freezes - LOVES her hoodie - she sees it and gets so excited, she is staying nice and warm! Decker rat terrier out for a stroll in her new sweatshirt...she loves it! Posted On 12/12/18 by Bonnie L B from Dallas, TX Yes, Bonnie L B recommends this product! Great quality hoodie! Sizing is spot on. I purchased a small which looks adorable and fits perfectly for my 7lb yorkie girl. She looks cute and stylish! Posted On 11/11/18 by diane c from tucson, AZ Yes, diane c recommends this product! I have a 10# malti-poo dog and I checked all the measurements before ordering. When the hoodie arrived I put it on her and it was very snug. I knew when I would get ready to wash it, it would shrink so I'm returning. Better to have a bigger one. The hoodie is really nice, just a little small. Love the color. Posted On 10/24/18 by Appleton from Appleton, WI Yes, Appleton recommends this product! Posted On 10/05/18 by Sheryn A D from , Yes, Sheryn A D recommends this product! i have ordered 4 pieces of clothing for my pet and they are fabulous the quality is great i am having a blast! Posted On 09/28/18 by Appleton from Appleton, WI Yes, Appleton recommends this product! It fits my chi/mix, however would like to have neck at least 1/2 to 1 inch larger. I purchased an XS for my 2.5lb pup and it fits terrible. Length is okay, however, legs are quite tight (awkward to get on), & the hoodie is far too large (way out of proportion compared to the rest of the garment). I have ordered a similar one before (without the pocket) & it fits fantastic (she still wears it to this day). Disappointed. I've bought several of the Zack & Zoey Basic hoodies for my toy poodle. She loves them, and I do, too! I've machine-washed them many times without any shrinkage, fading, pilling, or loss of integrity (I tumble dry them on low heat). Cute and worth the money! Posted On 06/17/18 by Randy C from Ventura, CA Yes, Randy C recommends this product! Posted On 05/24/18 by Joan K from Lakewood, OH Yes, Joan K recommends this product! Ordered this bright bark pink color as well. So many colors to choose from. Warm and soft to keep your pet warm on a cool day. Ordered 1 size up to make it loose fitting instead of a snug fit. Posted On 04/13/18 by Denise N from SI, NY Yes, Denise N recommends this product! Great sweatshirt. True bright pink. Bought size small for my <7lb min pin Zita and it fits perfect! Will buy more. Posted On 03/12/18 by Rachel M from Denver, CO Yes, Rachel M recommends this product! Posted On 02/26/18 by Heather M from IGH, MN Yes, Heather M recommends this product! Tucker was in between sizes as far as girth and length. I ordered according to his girth and it was a little to long length wise but I am going to have it hemmed for him! Great color and very comfy! Posted On 01/18/18 by Francoise Moros from Winchester, MA Yes, Francoise Moros recommends this product! Posted On 01/18/18 by Claudia from , IL Yes, Claudia recommends this product! Say yes to this bright cheerful hoodie. CUTE CUTE CUTE! Super nice fit, comfortable, easy to get on and off and constructed well. Lucy looks super cute. I throw a hoodie on her and then a regular "horse coat" for these super cold Chicago winter walks outside. Having a hood is nice as well because it protects the ears from the wind and layering will keep your pet warmer. I feel I really got my money's worth. These hoodies are also great alone for in the house at bed time to protect against drafts. Lucy is a English Pointer and Pointers don't have a lot of fluffy fur. If your dog doesn't have tons of fur then you owe it to your pupkid to keep them warm - these hoodies are great for that. Perfect for our little Pup-sicle! Posted On 01/04/18 by APRIL V from NOKESVILLE, VA Yes, APRIL V recommends this product! Nice fit and super comfy, washed well and doesn’t shrink in the dryer. Holds up well with frequent use and multiple cycles in the laundry. Posted On 12/22/17 by renee m from BENTON, MS Yes, renee m recommends this product! looks so cute on my bulldog..
Posted On 08/11/17 by Stephanie I from , MI Yes, Stephanie I recommends this product! I bought this hoodie for my puppy and she loves it!! It fits true to size and the color is great!! I will definitely be buying more as she grows! Posted On 07/10/17 by Linda W from Porter, TX Yes, Linda W recommends this product! Charlie Girl loves her new little hoodie. She even needs to wear them in the summer when we need the air on she will be cold but once her hoodie is on she seems to be just fine. Week made. We are always pleased. Many thanks. Posted On 04/12/17 by dawn s from warren, MI Yes, dawn s recommends this product! Posted On 04/06/17 by Sara F from Jackson, MI Yes, Sara F recommends this product! I just got this hoodie for my 13 lb. miniature dachshund & I couldn't be more pleased! The size small has plenty of length to cover her long body. I also love that it has a leash hole so I can easily attach a leash to her harness when it's time to go out. The "sleeves" are a bit long for her short little legs, but a little needle & thread will resolve that! With all the great color choices I will definitely be getting more! Posted On 03/11/17 by Pat from , Yes, Pat recommends this product! Cute hoodie but runs small. Ordered according to size chart and didn't fit my 6 lb girl. Gave to my daughter for her foster puppy and it JUST fit her and she is about half what my girl weighs. Posted On 02/18/17 by Angela P from , Yes, Angela P recommends this product! Love this sweatshirt! Easy to put on and take off, fits great, and made well. Posted On 02/03/17 by Bobbijo M from , CA Yes, Bobbijo M recommends this product! Posted On 01/27/17 by Mary Ann Watts from Gulf Breeze, FL Yes, Mary Ann Watts recommends this product! Posted On 01/19/17 by Terri C from Bethlehem, PA Yes, Terri C recommends this product! This is a great basic hoodie. I love this color and the wide range of colors you offer. It's nice and soft and my Yorkies even love wearing them around the house when it's exceptionally cold. And the price can't be beat. I may get some other colors cuz you can never have too many hoodies! Posted On 01/18/17 by Blanca K from Marlboro, NJ Yes, Blanca K recommends this product! Bought this for my daughter's Boxer and it looks great on her. Nicely made and easy to slip on. Bought a Large and it fits perfect. The Boxer is small for her breed and weighs under 50 lbs. Posted On 01/03/17 by Paula L from , Yes, Paula L recommends this product! I was very pleased with this item and would order from Baxterboo again. My dog seems to like the hoodie once it is on, but is not a fan of putting it on. She has a deep chest & this fits her pretty good but is a tad bit long for her. I will need to shorten it, but luckily I have a friend who loves to sew. The xxl fits my 125lb Dane. I also bought one the same size in red for my other 111lb Dane. They were a little tight at first, but stretch out a little and fit perfectly. Posted On 12/07/16 by Tammy M from Lancaster, CA Yes, Tammy M recommends this product! I bought this for my rescue pit bull who had been burned with acid. Needless to say she is missing fur on her back which causes some sensitivity. The material is super soft and non-irritating, the cut is well tailored to fit a dog's body unlike others I have seen that just hang on the body. I will definitely be a repeat customer. Posted On 12/07/16 by Karen B from Post Jeff Sta, NY Yes, Karen B recommends this product! Nice sweatshirt for layering or to wear alone. Color is beautiful. The shirts run a little big, but since I plan on using under a vest should be fine. Posted On 12/04/16 by CAROL M from , NC Yes, CAROL M recommends this product! Liked it so much, I bought two! Small fits a 9-10 pound chi mix perfectly! Posted On 11/29/16 by Lisa W from , NJ Yes, Lisa W recommends this product! I ordered 3, for three different size dogs, in 3 different colors and they are all great! The color, size, and make are perfect, and they wash beautifully. Absolutely will be re-ordering. Posted On 11/24/16 by Joyce M from Glasgow, VA Yes, Joyce M recommends this product! I bought this for my 45 pound Pit Bull and she loves it. I ordered an X-Large which is a bit too large for her. I am going to order a large for her. Shipping was incredibly fast. Emma has had her hoodie on since it arrived in the mail! They are very well made, the fabric is very nice. Leash hole works well with her harness. I would recommend this hoodie to anyone wanting to give extra warmth to their pup. Posted On 11/21/16 by Carla D from Newark, NJ Yes, Carla D recommends this product! Posted On 11/18/16 by Donald H. W from Demotte, IN Yes, Donald H. W recommends this product! When Hoodie sweatshirt showed up I put in on Precious, she went out when she came in she liked the Hoodie so much she did not to take it off. Thank You for go quality keep up the good work. I have passed on the word where to get good clothes. Posted On 11/16/16 by Tina B from Boise, ID Yes, Tina B recommends this product! Love, love, love this affordable, cozy sweatshirt for my pittie! Posted On 11/16/16 by Gail M from Alliance, NE Yes, Gail M recommends this product! The color is true to what is shown on the web site. The material is nice and soft with strong seams. My little chihuahua looks sooo cute in this darling hoodie! It is soft and the extra small fit her perfectly! Posted On 10/22/16 by Terry S from Smith , NY Yes, Terry S recommends this product! Posted On 10/20/16 by Katrina L from Branford, CT Yes, Katrina L recommends this product! This is the second time I've bought this for my 75lb pitbull. The first one lasted 2 years which was way longer than expected, since in the wintertime she wore it very frequently. Posted On 10/02/16 by Kathleen O from Davenport, IA Yes, Kathleen O recommends this product! New rescue doggie didn't have enough hoodies. Goes to day care, room is pretty cold, and now I won't have to wash hers every night. I love the fuchsia, goes great w/a coat I bought late season. Easy to put on, nice and long to cover her rump, and the ribbed end will keep the wind from getting under. First time I tried Baxter Boo, and I will come back again. Posted On 09/20/16 by Susan G from Olympia , WA Yes, Susan G recommends this product! This is a lovely pink color, soft and well made. I will be getting it embroidered to customize. Love the quality and the price. Posted On 09/19/16 by Gloria V from Arlington, TX Yes, Gloria V recommends this product! Great quality, easy to put on, and my dog loves it. She had surgery so she gets cold very easy. She loves it when it's on. Posted On 09/02/16 by Sharyn L from , Yes, Sharyn L recommends this product! Lightweight sweatshirt was true to size and easy to order. Wish it was a heavier weight for colder months. Very cute though. Posted On 05/06/16 by Marie G from Athens, GA Yes, Marie G recommends this product! My hairless pup loves this! She lounges all day and will even venture outdoors. Highly recommend for those dogs needing something warm to lounge in. Posted On 04/30/16 by Randy C from Ventura, CA Yes, Randy C recommends this product! My Lorraine Just loves her raspberry sorbet hoodie she won't let me take it off , great bright color and quality material.!! Posted On 03/20/16 by nancy d from Mount Vernon, NY Yes, nancy d recommends this product! I love it. The fit is excellent and the color is vibrant. Posted On 03/12/16 by Anna G from keysne Heights, FL Yes, Anna G recommends this product! love the color on valentine, she looks good in it . Posted On 03/10/16 by Holli t from Hale, MI Yes, Holli t recommends this product! Posted On 03/09/16 by Andi from NYC, NY Yes, Andi recommends this product! Fit my dog perfectly and is super cute! She seems to like it and I think it's helping to keep her warm in the NY winter. Posted On 02/21/16 by Ortal G from Milford, CT Yes, Ortal G recommends this product! Great color and quality, as usual with all zack and zoey products, this one doesn't disappoint. the quality is great, the material is soft and warm, and for small dogs I always appreciate a hole for the harness loop. Posted On 02/14/16 by Barbara Y from Katy, TX Yes, Barbara Y recommends this product! My rescue babies Roxy and Bella love their hoodies! They are perfect for lounging inside or walking outside! Also perfect for personalizing with their name. Posted On 02/04/16 by Maria T from sylmar, CA Yes, Maria T recommends this product! Posted On 01/16/16 by Gail K from , Yes, Gail K recommends this product! Posted On 01/13/16 by All About Pets Staff from Oakland, CA Yes, All About Pets Staff recommends this product! Posted On 01/11/16 by Natasha B from , NJ Yes, Natasha B recommends this product! Got this as a gift for a Min Pin that's forever cold. It fit her nicely and helps keep her warm while she lounges in the home. OMG Amazing. The color is perfect, and it fits my round pit/bulldog mix perfectly. LOVE! Posted On 01/01/16 by Mary Ann S from Jacksonville , FL Yes, Mary Ann S recommends this product! Posted On 12/26/15 by Mary Ann S from Jacksonville , FL Yes, Mary Ann S recommends this product! We love these hoodies!! We have 5 dogs and they each have several !! This one was purchased as a gift for our neighbors dog as a Christmas gift!! Posted On 12/08/15 by Joan R from Farmington, CT Yes, Joan R recommends this product! This is the third sweatshirt I have ordered. The quality is excellent and fits perfectly. Posted On 11/27/15 by michelle h from Sacramento, NM Yes, michelle h recommends this product! I have ordered many of these hoodies so when i rescued another chihuahua i had to get her one. They are nice and warm and good quality. Posted On 11/20/15 by Shannon C from Midland, TX Yes, Shannon C recommends this product! love it, and it fits my Bella perfectly! Posted On 11/15/15 by Emma L B from Tallahassee, FL Yes, Emma L B recommends this product! Love, love, love the hoodie!! Fits perfectly and our sweet girl loves it. Will soon order more! Posted On 11/13/15 by Celeste from Sylmar, CA Yes, Celeste recommends this product! Super soft and warm - my dog loves It! Posted On 11/13/15 by Jo Ann B from Rockford, IL Yes, Jo Ann B recommends this product! Posted On 11/12/15 by Nancy T from Dayton, OH Yes, Nancy T recommends this product! This hoodie looks so cute on my dog ....and the color is perfect ! Thanks BaxterBoo ! Posted On 11/04/15 by viviana c from , VA Yes, viviana c recommends this product! Posted On 11/01/15 by Angie J from Arlington, TX Yes, Angie J recommends this product! I bought two of these for my pugs. The medium fits well on my 17 lb girl. I bought a large for my 21lb boy but it's too long for him. The girth fit is perfect though which is hard to find for a stalky pug so I think I'll have it taken up in the length. This is a nice, perfect weight material and it come with a leash hole which is great! Love them, dogs love them... we have 5 now! Posted On 10/26/15 by Christina M from , NY Yes, Christina M recommends this product! These are awesome little hoodies to keep my chihuahua mixes warm. The only problem is for my boy, it's too long so when he has to go pee... well, the hoodie then needs a wash. I just make sure to fold it up when its bathroom time. Posted On 10/23/15 by Tiffany R from Pegram, TN Yes, Tiffany R recommends this product! This is a nice hoodie, has soft lining on the inside, not very stiff so it's definitely stretchable (to a certain point). I have a 60lb Golden Retriever/Collie mix and ordered the XXL. It's a tad long for her, but after washing it, fit pretty good with room for her to move. Posted On 10/01/15 by Tina H from Little Rock, AR Yes, Tina H recommends this product! Love it!! Fits a stout (100) Doberman, love the length, keeps her covered--now we can both sleep since she is not cold. Posted On 09/16/15 by Jennifer M from Rogers, AR Yes, Jennifer M recommends this product! I love this hoodie! It's nice and long so it comes all the way to her tail! She's very comfortable in it and it's so soft and snugly! I want them in every color!!! Posted On 09/03/15 by carl s from winthrop harbor, IL Yes, carl s recommends this product! Nice product and fair price. Have in several colors.Size chart is a good tool to use. Posted On 08/17/15 by Carol S from Bellingham, WA Yes, Carol S recommends this product! I love this hoodie. It will be nice and warm for the cooler coming months. It also is easy to put on and take off. Posted On 07/11/15 by MARI W from Dallas, TX Yes, MARI W recommends this product! This color looks so good on my little white Pom and will keep her crippled back warm this fall. Posted On 06/25/15 by Jocelyn M from Pembroke, Ontario, Yes, Jocelyn M recommends this product! I just love this simply adorable doggy hoodie. The size is perfect. The color is perfect. Shipping was perfectly on time. Excellent product. Excellent customer service. Posted On 05/20/15 by Jennifer B from Saginaw, MI Yes, Jennifer B recommends this product! These hoodies are awesome! They fit great and hold up well when washing & drying. Posted On 05/15/15 by Laurin P from , MA Yes, Laurin P recommends this product! I measured my dog before ordering and the measurements shown on the site were accurate. My dog is 5lbs. I bought an xs. Love the color! Posted On 04/18/15 by Stacy D from San Jose, CA Yes, Stacy D recommends this product! Posted On 04/12/15 by lisa g from pensacola, FL Yes, lisa g recommends this product! Posted On 04/09/15 by Jacqueline A from Sheboygan, WI Yes, Jacqueline A recommends this product! Purchased this for layering clothing on my 4 lb Chihuahua, Pebbles. It is soft, well made, and left plenty of room for t-shirts or sweaters underneath. Posted On 03/13/15 by Tammy S from Troy, NY Yes, Tammy S recommends this product! Love these hoodies - my little girl has them in every color - perfect for cool mornings in the spring and fall or under her coats on a cold winter day. Excellent quality for the price. They run a little big but was perfect for my dog. Posted On 03/10/15 by Stephanie W from Nashville , TN Yes, Stephanie W recommends this product! I like the hoodie, but seems to run small. I ordered smalls for my mini schnauzers who weigh in @ 16 lbs. I will be ordering mediums next time. Go up a size. Other than that, they are great. Posted On 02/18/15 by Karen C from Pleasant Hill, CA Yes, Karen C recommends this product! Posted On 02/12/15 by Margie M from North Augusta, SC Yes, Margie M recommends this product! These are perfect for warmth in the little cooler weather this time of year in South Carolina. Posted On 02/11/15 by Stacey C from Allentown , PA Yes, Stacey C recommends this product! Posted On 02/08/15 by Lisa S from Portland, ME Yes, Lisa S recommends this product! I originally bought it for my 6 lb Yorkie (xs) ,but it was perfect for my 15 lb York! Posted On 02/06/15 by Kelci S from Longview, TX Yes, Kelci S recommends this product! Our puppy loves these hoodies! She has this one and a red one. She dives into them for us to put them on her. She runs and plays and they stay in great shape. She has been cold this winter and has basically lived in her hoodies! Posted On 02/04/15 by Dena F from Reading, PA Yes, Dena F recommends this product! I love these hoodies. This is the only true website to find nice, sweet adorable clothes & jackets.I'm so thankful for baxterboo & my dogs appreciate it too! I recommend this site to all my friends & family! Posted On 02/01/15 by DeAnna W from Redmond , OR Yes, DeAnna W recommends this product! The hoodie is so dang cute & fits our yorkie so nice! Posted On 01/29/15 by Mary Lynn S from , Yes, Mary Lynn S recommends this product! My little Morkie now has 3 of these sweatshirts - and living in the cold, snowy, muddy north she uses all three regularly. They keep her warm and keep her clean. They are true to size (at least the medium is) and are a snap to wash up when they get dirty. They even go over her head with ease! These are what she wears when she's out on the town! Posted On 01/28/15 by Joy N from Birmingham, AL Yes, Joy N recommends this product! This is a great hoodie for the cooler months of the year, especially if your dog is short haired like ours. He loves his hoodies, and this brand in particular has a great fit and the material feels soft and very durable. Our dog has multiple colors! Posted On 01/28/15 by Deborah M from , TN Yes, Deborah M recommends this product! I am completely satisfied with my product. When I first got it, by glancing at it, it didn't seem like it was going to fit. From the measurements provided I'd chose a medium. However when was putting it on my dog, the material stretched a little bit to actually fit perfectly. I must say it is adorable on my dog. I would definitely recommend the hoodie! Posted On 01/28/15 by Joanne G from W Bloomfield, MI Yes, Joanne G recommends this product! Posted On 01/20/15 by Sara G from , TX Yes, Sara G recommends this product! Posted On 01/15/15 by Dianna G from Janesville, WI Yes, Dianna G recommends this product! Love the weight and fit of this dog hoodie! Easy to use website and quick delivery too! Pretty in Pink, sort of!!! Posted On 01/14/15 by Sandi P from Pottstown, PA Yes, Sandi P recommends this product! Cybele loves to wear these tops. Besides looking cute, they keep her warm during the very cold winter days. The tops are made very well; they maintain their size and shape after many washings. A good buy!! Posted On 01/03/15 by HOLLY I from Birmingham, AL Yes, HOLLY I recommends this product! I bought this for my female Boston Terrier that weights approx 26lbs and is broad chested. It fit her well except for being too long. I will have to shorten it for her. Posted On 12/25/14 by Carmen T from North Fork,, CA Yes, Carmen T recommends this product! I bought this hoodie for my large dog Darla who HATES to wear sweaters and coats but she loved this hoodie. I plan on buying her more for the winter months. Posted On 12/25/14 by Hilary G from Richmond, VA Yes, Hilary G recommends this product! High quality wash and wear sweatshirt, holds up to rough play or all day snuggles. Posted On 12/23/14 by Nadine J from Whitesburg, GA Yes, Nadine J recommends this product! Bought this extra big so the pup will grow into it. So very well made and another very good purchase made on BaxterBoo. Posted On 12/21/14 by Cindy B from Satsuma, FL Yes, Cindy B recommends this product! My pup loves her new hoodie, just the right weight to keep her snug when it's cool and damp. Posted On 12/14/14 by I from , TX Yes, I recommends this product! My little poodle gets so cold - this hoodie is the perfect fix. Very soft & comfy! Posted On 12/13/14 by susan c from Florence, OR Yes, susan c recommends this product! Posted On 12/12/14 by Leslie H from Leavenworth , KS Yes, Leslie H recommends this product! I was very pleased with the actual product and the prices and shipping times were great. There is a significant size difference between the extra large and 2x but we made them work. Overall I will definitely purchase from this company again. Posted On 12/08/14 by Donna S from Marietta, GA Yes, Donna S recommends this product! Loved this very much for Bailey. Posted On 11/30/14 by Deborah R from Pleasanton, CA Yes, Deborah R recommends this product! I purchased this for my dobe mix. She gets really cold in the winter and shivers. The plan is for her to wear this at night when our heater goes off. The XL fits her nicely and will keep her plenty warm. Posted On 11/28/14 by melony from , MI Yes, melony recommends this product! Posted On 11/28/14 by Erin F from Davis, CA Yes, Erin F recommends this product! Love this hoodie. It fits really well for my lovely little female puggle. After a few days of wearing, it can get longer and pulled slightly out of shape, but nothing terrible. I don't think it would work well for male dogs, since it is the same length on the back as underneath, so it would get in the way if they tried to pee. Posted On 11/27/14 by Lorena M from Brooklyn, NY Yes, Lorena M recommends this product! Posted On 11/22/14 by Erica R from , Yes, Erica R recommends this product! Posted On 11/20/14 by Kelsey from Houston, TX Yes, Kelsey recommends this product! This is a great sweatshirt for my little dog! Posted On 11/16/14 by Linda M from Westland, MI Yes, Linda M recommends this product! We bought this hoodie for our new rescue girl, she is a yorkie,/ Chihuahua mix and so adorable. She likes to wear clothes, especially in this cold weather we are having. She looks adorable in it! Posted On 11/15/14 by Sandra M N from , HI Yes, Sandra M N recommends this product! This will be.my sister's puppy 1st Christmas and this jacket will be so cute on her. A fall/winter wardrobe must have! Posted On 11/12/14 by Jessica Sh from Richboro , PA Yes, Jessica Sh recommends this product! I love these basic hoodies! We started out with the grey ones but then when I saw how warm and cozy they kept my dogs I ordered more in many different colors. Sizing is great, quality is good value for the money, they can be washed easily, and are a must have for the fall/winter. Posted On 11/10/14 by Jean B from Haubstadt, IN Yes, Jean B recommends this product! Love the color and is made very well, but it is too large for our dog. I will be returning it for a smaller size. Posted On 10/23/14 by Erin K from Honolulu, HI Yes, Erin K recommends this product! The hoodie is one of my favorites for quick, sure warmth for my little Yorkie. Posted On 10/22/14 by Irene F from , NY Yes, Irene F recommends this product! Size is everything and the raspberry color is delicious. Posted On 10/22/14 by Jennifer M from Brookfield, WI Yes, Jennifer M recommends this product! It is a very pretty color and fits our dog perfectly! I love that is long on the back and goes to her tail. She loves it cuz it keeps her warm. This is our second hoodie. The first we bought for our very large male dobe which fits him amazingly perfect. Posted On 10/22/14 by Barb G from Savannah, MO Yes, Barb G recommends this product! Although the measurements indicated a proper fit, the shirt was too tight for our French bulldog's neck. However, for a dog with a "normal" sized neck and shoulder area, it would be wonderful. Posted On 10/22/14 by Max from Chicago, IL Yes, Max recommends this product! Fits true to size and great quality! My fur baby loves it. Posted On 10/17/14 by Kathleen S from , Yes, Kathleen S recommends this product! Perfect for winter here in Las Vegas. Posted On 10/10/14 by Delores Bowles from Rock Hall, MD Yes, Delores Bowles recommends this product! Posted On 10/09/14 by Terri T from Kenosha, WI Yes, Terri T recommends this product! This is so cute, I have a Yorkie that is longer in length than most Yorkie's so small's are never long enough, plus this color goes good with her "sister's" violet sweatshirt. Posted On 10/07/14 by Marsha A from Biloxi, MS Yes, Marsha A recommends this product! Callie, Kati, Trixie and Lissa Lu having matching Raspberry Sorbet hoodies this year! Can't wait for it to get cool enough to wear them! All of my furbabies having these hoodies, perfect for that chilly winter day. Posted On 09/23/14 by melony m from , Yes, melony m recommends this product! Posted On 01/26/14 by Kaitlynn from Vineland , NJ Yes, Kaitlynn recommends this product! Fits great. Daisy really loves her new hoodie. Can't wait to order more! Posted On 12/28/13 by Donna B from Marcellus, MI Yes, Donna B recommends this product! Bought this for my daughters American Staffordshire. True to size. Make sure you go by "chest size". Posted On 12/11/13 by Amanda K from Philadelphia, PA Yes, Amanda K recommends this product! I love these hoodies! I almost own the whole collection for my 3 babies! They're perfect-- warm, adorable, many color options. Just make sure you size correctly because I accidentally ordered a size too big for each of my dogs and they were getting stuck in them... I sized down immediately and everything has been ok since. Don't want your furbabies getting hurt :) They're supposed to be a little snug. Just be careful! LOVE these hoodies! The pink is a great color! Posted On 11/23/13 by Amanda K from Philadelphia, PA Yes, Amanda K recommends this product! These Basic Dog Hoodies are perfect to keep your dogs cozy while also looking adorable. I have been collecting every color since I received my first Raspberry Sorbet ones. These hoodies aren't restricting at all and the fabric is nice and warm. I STRONGLY suggest getting these for your furbabies! Posted On 11/17/13 by AIMEE B from buffalo, NY Yes, AIMEE B recommends this product! My dog is an English Lab who is very Wide through the chest area. Dog clothes never fit her...but this Hoodie DOES. I also like that it covers right down to the base of her tail as well as her belly. She loves playing in the snow, while I shovel the driveway! This hoodie is very cute and keeps my Boston Terriers warm here in North Dakota. The hoodie fits really well and comes in so many colors. It seems to be made very well. Posted On 11/08/13 by Vicky C from Saginaw, MI Yes, Vicky C recommends this product! LOVE the hoodies! So soft, and I love that it covers the length of her body. I have a friend who is putting names on this hoodie, and a breast cancer ribbon (Sadie is a survivor!) and I can't wait to get them back so we can go for walks and show off the hoodies! Posted On 11/07/13 by Jillian K from , Yes, Jillian K recommends this product! Love these hoodies. They wash up nice and look adorable on the puppies. They aren't super warm though so if you're wanting something warm to help your little dogs brave the cold on walks, go for the fleece lined hoodies. Posted On 11/07/13 by S.A. Warrens from Conway, , AR Yes, S.A. Warrens recommends this product! This is a very soft, cuddly hoodie that is sure to keep any dog warm. My baby is an Italian Greyhound and very hard to fit. This hoodie is long enough and fits well. We could use a little more room in the chest. Greyhounds are chesty with long bodies. This hoddie covers her length well. The fabric is soft and it is well made. I recommend. Pink is our Tiny's color. She looks so girlie girl in it. She loves to be fashionable. Posted On 11/07/13 by tonya s from oriental, NC Yes, tonya s recommends this product! Nice color, cotton to stay cool and warm! Sammi and Sofie road in a bike ride in Atlantic Beach NC, they enjoyed a 40 mile ride! Posted On 10/24/13 by Amanda K from Philadelphia, Yes, Amanda K recommends this product! These hoodies fit perfectly according to the size chart... I also like how they included a video with instruction on how to measure your furbabies. The band around the arms is very loose and not restricting which is fantastic... the thickness of the hoodies is nice and it will actually keep my pups warm. These are so wonderful. I love them and so do my dogs... I am buying more as soon as the colors I want are in stock for the size I need. Best hoodies I've found yet! :) I'm also planning on getting them embroidered with their names as suggested in the product description video. So wonderful! I couldn't be more happy. Also, BaxterBoo shipped these out QUICKLY! I got them immediately. I love BaxterBoo and I'm so glad I found this site! This is my second order and I have been highly satisfied with everything. I have told several friends and will continue to do so.